From a very young age Meg Moore, owner of Juice Kids Haute Couture, had a passion for clothes. Her passion developed into children's clothing with the birth of her three daughters. Meg believes that clothes should be original and should say something about the child wearing them, that's why she created Juice Kids Haute Couture. There you will find an eclectic style of clothing geared towards letting children develop their own style, where both child and mom will be happy. Each item in the shop has an emphasis on comfort and self expression. It's a blend of styles that suit every child's taste. The stores modern twist on vintage styles is a breath of fresh air, especially in the historic town of Hartsville, South Carolina where the store is located. If you don't live in South Carolina don't worry, Juice Kids has an amazing online shop. They carry boys and girls sizes 0-14 and also offer a little something for mom. Of course you will find the good ole' Southern hospitality at Juice Kids. They pride themselves on their great costumer service and going the extra mile. Meg is even known to do some personal shopping for her customers. Meg is giving away a shirt to two of my readers. The first shirt is this fun Euro Cruiser Tee from her Wonderboy line. Available in sizes 6 months- 10 yrs. The other shirt is this darling Bird tee from her Stun Collection. Make sure to specify which shirt you would like to win. Receive free shipping on the Wonderboy and Stun lines. Receive 10% off your order when you mention this blog! Oh, that bird tee is too cute! I also like the antique slip dress. my kiddos would love these tees! New follower to your blog! 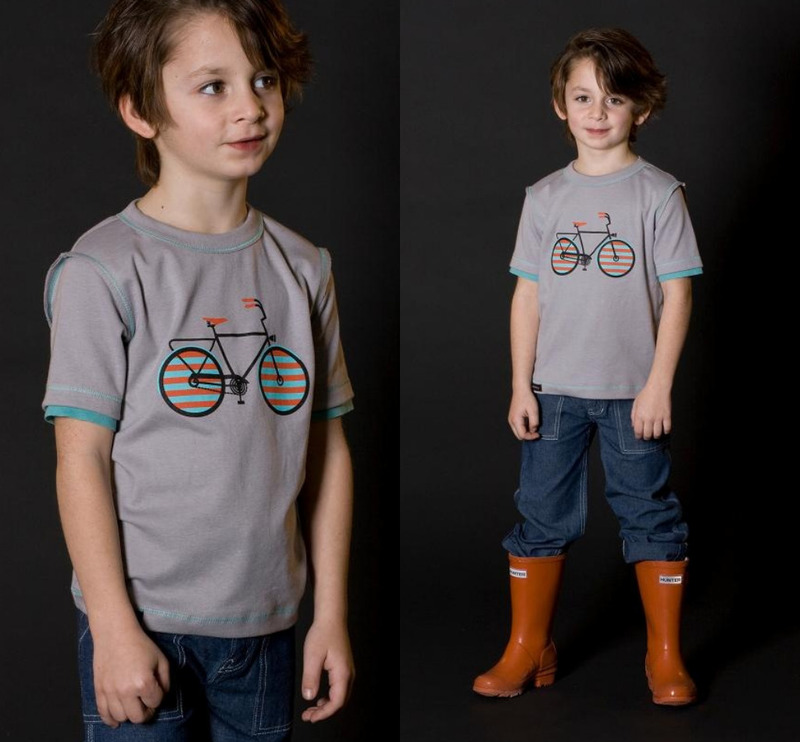 I love th ebulldog t-shirt on the site, and would love to win the little boy's t here! I love the whole neige line. adorable. Of course I follow you and this is wonderful so cute!! Love the bird tee - very cute. I have a boy, so if I win I'd love to get the boy's shirt. They are both so cute, but Meg is way into biking, so I think we would go for that one. so cute! love the bicycle one -- would be perfect for my little nephew! Love the a line dress! thought i already followed,,guess not- well i am now. you know i'm lovin' that wonderboy shirt! Even though I'm older than ten can I still enter for the bird tee? MAybe I could fit in it and i think it's really cute! I love the Cecilia day dress! I just love the Lucky Jade Cashmere Cotton Dandelion Blanket. I love the Wonderboy Skinny Shorts. Super cute! :) I would love to see my little guy in one of these someday. Their baby clothes are so sweet! I love the neige organic striped top. I'm following you on Twitter. @BabbleBird. Oh. And, I'd want the euro cruiser tee. I love the blue snail coverall. I love the Avril MJ shoe! My favorite is the Black Ruffle Dress by Appaman. I love the Helicopter Tee, my boy would look so cute in it! We love the Seat Cushion Marakesh we found in the furniture section. We love your blog. We love your family more. I love the Right Bank Babies Groovy Sixties Dress. Thanks. I love the Ana skirt for me, and since I have boys, would have to go with the Cruiser shirt. Come visit me, I'm having a giveaway too, for a Meri Meri Cupcake set! cute stuff...i like the black skull slip on's and the little brother t-shirt...as for the giveaway love the euro cruiser tee.. I am now a follower of your blog!! It was hard to choose just one, but I really like the Wonderboy Skinny Shorts they seem practical and very stylish!! My favorite item on their site is the Emma Dress, cute! e euro cruiser is my favorite.my 4 yr old would love it! My favorite item on the Juice Kids site is the Liberty Print Bloomer. I'd love the girls shirt! mcalcut is following juice kids on twitter. mcalcut is following you on twitter. My middle son Casey is almost 3 and loves the color lime green and loves dogs. The Appaman shirt is so him. OMG I LOVE the Ava Block dress in gray!!! Now following JuiceKidCouture on twitter! Im following Juicekids on twitter too! My daughter needs a shirt that cute. i think the two tops you pictured are my fave...i have a thing for birds and bikes! would love to win! I love the boys' egg baby zip front jacket! If I were to win, I'd choose the Euro Cruiser tee. I like the Uncle Sam Slub Tee. I like the Bella Top.